A Redditor has shared the hilarious item he received after failing to properly read its description. All cat-lovers know that our favourite pets have a knack for giving the most unimpressed looks ever. They can take or leave us and it's all part of their charm. 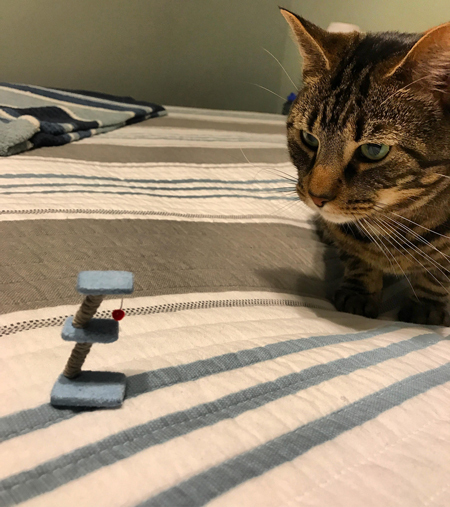 But, when one Reddit user decided to treat his feline friend to a cat scratching post from Amazon, he must have got a seriously underwhelmed expression when it finally arrived. As cewallace9 revealed, in his excitement to snap up a $20 bargain from the online shopping site, he neglected to check its dimensions or the fact it was referred to as a "dolls house". Oh dear. We're pretty sure his kitty couldn't even fit one claw on that thing, let alone its whole body! Still, it made for a pretty cute picture, and served as a strong warning to us all.